The IoT, and in particular its industrial cousin, the IIoT, has brought a lot of attention to what goes on inside a manufacturing enterprise. In the past, most of the data from sensor to business system has been used internally for a variety of tasks from control through process improvement to quality and business improvement. Now all that data will become part of the IIoT. 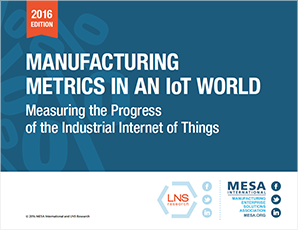 Results from the recent “Metrics that Matter” survey from LNS Research show that a small proportion of manufacturers are starting to make serious efforts to implement IIoT technologies and expand their use of analytics across and even beyond the enterprise. This eBook examines in detail some of the other key findings from the survey and demonstrates how Manufacturing Operations Management (MOM) is still at the center of data collection, information handling, and operations management in most enterprises. The impact that IT trends are having on the MOM space are investigated, and suggestions are given as to where thing will go in the coming years.